How does an innovative theatre chain keep people coming to the movies amidst the explosion of streaming and subscription services? We helped Cinemark give movie fans a new way to get more of what they love from the movies: the first exhibitor-sponsored subscription program. Cinemark made it simple for movie lovers to get more out of what they love from movies, building loyalty around what their guests love. Cinemark Movie Club surpassed performance goals out of the gate and has exceeded Cinemark’s original first year forecast by 2X. With the explosion of streaming video services, binge-worthy content, new subscription models and the growth of dine-in movie theatres, movie lovers have no shortage of options. Cinemark wanted to ensure that its guest-driven experience recognized and rewarded their passionate fans. T3 worked closely with Cinemark to shape, position and brand two successive and interrelated loyalty initiatives: the launch of an industry-first monthly subscription program and an evolution of its popular rewards program. Before MoviePass started generating buzz, Cinemark was working on its own monthly subscription model—a new concept for movie theatres. Working from extensive social listening and customer research, T3 understood what movie fans truly valued. We then designed a way to reward guests with red carpet treatment while tapping into all they love about the movies: the films, the concessions, and attending with family and friends. We made it both rewarding and easy for guests to not sign up for a program but to join an exclusive new club, Cinemark Movie Club. Consumers can be skeptical of subscriptions unless they clearly demonstrate value. With movies, guests were accustomed to getting tickets at the box office or buying and reserving seats online. A monthly subscription was a new genre. 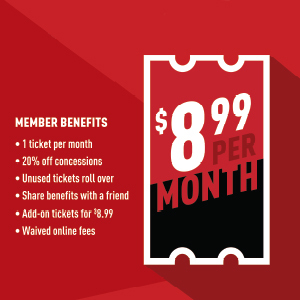 However, research told us that consumers loved the depth of the benefits of Cinemark Movie Club, including a ticket discount, 20% off concessions, waived online fees, the ability to share benefits with a friend, the flexibility to roll over unused tickets to the next month and points that never expire. Cinemark Movie Club was positioned as The Movie-Lovers Membership. The value proposition focused on clear, simple benefits that were reinforced with icons. Those icons, kinetic type, and a bold crimson and black color palette helped the campaign stand out in movie trailers, in theatre posters and digital display, in social media, and across Cinemark’s digital properties. A brand playbook made it easy for Cinemark creative teams to adapt the campaign over time. Cinemark Connections, the brand’s first loyalty program, had built a strong following as customers redeemed points for movie merchandise, concession discounts and exclusives. But since its launch, dollar-spend models had become the norm across categories (think Starbucks) with clear goals for points redemption (Starbucks drink/item of choice). T3 managed economic modeling for the evolved program to ensure that movie fans could redeem points for what they valued most, movie tickets, that aligned to business goals. The new program also created an opportunity to introduce a new name and look while unifying Cinemark’s overall loyalty offering under a new name: Cinemark Movie Rewards, with two customer levels. Movie Fan lets customers earn 1 point for every $1 spent, redeem points for tickets and more rewards, gain Member access to screenings and advance tickets, get free popcorn and drink refills, and take advantage of exclusive offers. Movie Club offers all those elements along with the benefits of the monthly membership. T3 created the Movie Rewards logo, icons and design system, and collaborated with the Cinemark creative team on campaign elements that are used in theatre signage, email, social media and other channels. T3’s mobile ordering solution offers restaurants a world-class ordering and loyalty experience that’s affordable and easy to install—and it gets them to market fast. We created a hyper-personalized, fully responsive site experience that let viewers see and protect their homes in a whole new way. From discovery to deployment, we introduced Pizza Hut to the new way to win at loyalty. Our modern thinking, architecture and execution produced a platform that blew competitors away.